We’re excited to announce the availability of the AgentPress Listings add-on support for Conductor. In today’s tutorial, we’ll show you how to setup AgentPress Listing and Carrie Dils’ Winning Agent Genesis Child Theme to leverage Conductor for custom listing page displays. We’re making it easy to display custom listing layouts including AgentPress custom fields — without code. 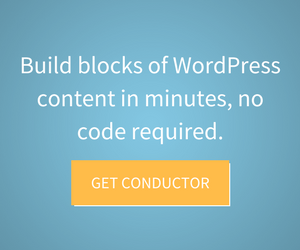 We shipped the latest version of Conductor with WordPress 4.0 support and it’s Scott’s birthday! Scott’s the lead developer of Conductor and Director of Web for our parent company, Slocum Studio. Let’s take a look at some new key features in this release and find out how you can save 10% for our birthday celebration. We’re happy to announce the latest update to Conductor. This release contains improvements for the WordPress 4.0 Customizer. Conductor was born from a need we discovered within our custom WordPress work at Slocum Studio. While building content-rich sites for our clients, we were constantly asked for a solution to customize the website’s display of content. From site to site, we were building use cases for an easy-to-use plugin that produced a user friendly widget. Something that was powerful enough for developers, but easy enough for the common author or editor to manipulate. WordPress is best and originally used for publishing content. However, most WordPress themes display content using the same stale display. Out of the box, WordPress doesn’t allow us to curate unique collections of our content to put on display for our visitors. Conductor changes all of that.